With over 3 million companies worldwide now using G Suite to power their business, Atomic Reach is making it easier than ever to work with Google Docs to create, score, and edit your content, on your own or with your team. No more flipping between windows or copy-pasting, you can now load specific Google Doc drafts right into the Atomic Reach environment through the Atomic Content module with just the click of a button. You and your team can collaboratively work on creating your content within Google Docs, then simply verify which Google account you’d like to connect with Atomic Reach and select the file you’d like to import for optimization – it’s that easy! 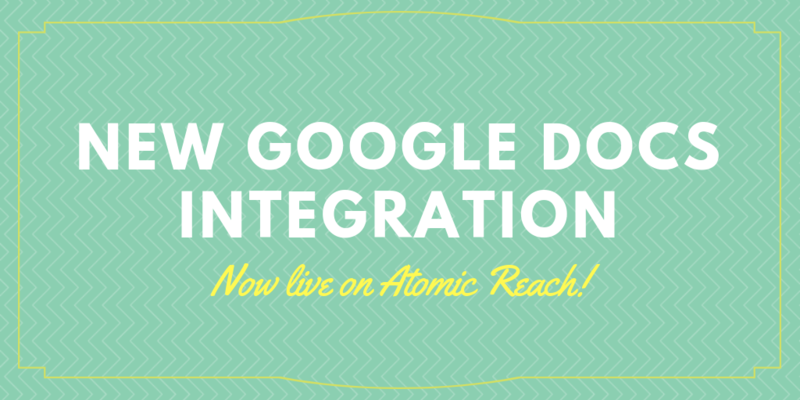 If you’re already an Atomic Reach user, you can check out this new integration here. If you’re new to the platform, you can sign up for a free trial or book a tour of the platform with an Atomic Reach representative to see it in action. How do I use the Google Docs integration for Atomic Reach? How do I Edit a Document in the Writing Tool? How do I Share a Completed Draft?